Between all the excitement and busyness in the studio, we have finally managed to spare five minutes to share the biggest story in town – Dippy on Tour. 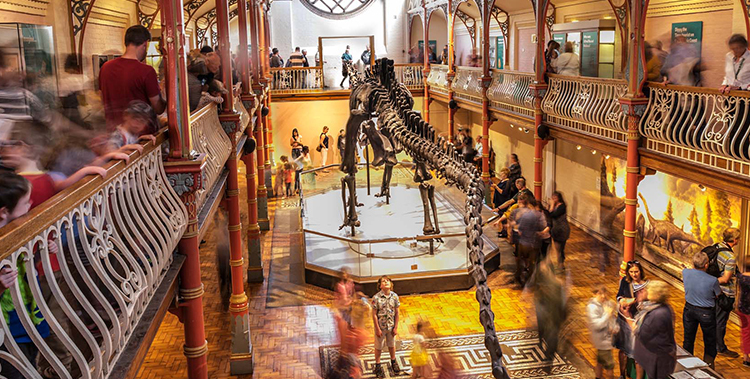 For nearly a year, we have had the pleasure to support Dorset County Museum (DCM) with the PR, social media and event management of their very special, very big guest, Dippy the Diplodocus. Doubling their target of 70,000 visitors during his 12-week stay, the Museum welcomed a record-breaking 153,189 visitors becoming the most visited exhibit ever! Prior to the tour, we worked closely with DCM and the Natural History Museum to create all the branding used in Dorset including press ads, internal signage, high street flags, shop window displays, online artwork and more. We also issued a number of press releases, securing coverage in local, regional and national press including print, radio and TV. We were heavily involved in the organisation of the opening events including the press launch which was aired live on BBC Breakfast, the VIP event and a family event during the opening weekend. And as the saying goes ‘time flies when you’re having fun’ – last week it was time to wave goodbye to Dippy as he moves on to his second stop of his UK tour. To celebrate, we worked with the Museum and Hanna Trevorrow from DASP to host a farewell sing song with over 250 local children. Dressed in Dippy tees and waving flags (designed by us of course) the children paraded from Brewery Square to the Museum where they gathered around Dippy one final time to wave goodbye, singing the ‘Dippy the Dinosaur’ song. It has been an extremely exciting time having Dippy to stay in Dorset and absolute pleasure to be involved in his adventure. You can read about Dippy’s final days in Dorset here.